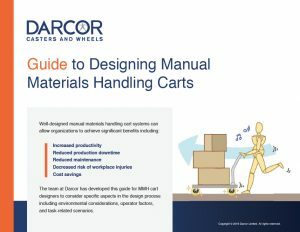 Over the past four years, Darcor’s Workplace Ergonomics and Caster Technology Blog has emphasized the utility of good cart design, especially with regard to careful consideration of the required operating forces. Failure to act to control risk or making poor decisions in the design of manual cart handling tasks or in the evaluation of risk during push and pull tasks incurs costs from injuries, productivity losses, and operational inefficiencies. The cost of a single lost-time back injury case is estimated to be somewhere between $40,000 and $80,000. Hodgins noted that reducing the force required to push order-picking carts in a warehouse resulted in significant gains in productivity; on average, the warehouse workers were able to complete about 10% more order picking trips per day. Finally, there are often less apparent costs associated with injuries. For example, a study by Freburger et al found that individuals who are experiencing back pain are only fully productive about 90 percent of all workdays each year. The evaluation of risk of injury associated with manual cart handling tasks is commonly accomplished via use of tools such as the Liberty Mutual Manual Material Handling Tables and the Ohio State tables. Each of these gives an estimate of the percent of people capable of exerting a given level of force. Several researchers have found that individuals exerting forces in excess of the strength capability are more prone to injury; Snook found that using push or pull forces that at least 75 percent of females were capable of exerting lowered the risk of injuries for both men and women. A good practice for the design of carts and for reducing the risk of injury resulting from manual handling of carts is to specify cart designs and components that allow the use of operating forces that at least 75 percent of females are capable of exerting to start the cart moving, sustain movement and to turn the cart. The ISO standard for push pull forces recommends 90 percent capability for cart handling forces in some situations; a higher percent capable for each component force may be advisable for composite MMH tasks. 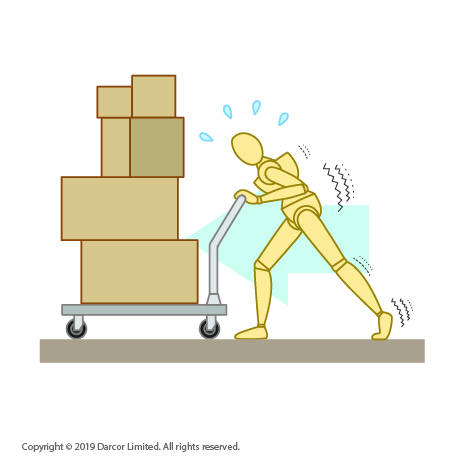 Composite MMH tasks are those that include multiple force exertions; for example, lifting a box and placing it on a cart, starting the cart moving, turning the cart at a corner, etc. In order to ensure continuous cart ergonomics performance, periodic maintenance is recommended to ensure that the cart operating forces remain within recommended limits throughout the economic life of the cart. Over time, cart frames may be knocked out of alignment so that they don’t track true, casters may develop flat spots, bearings may wear, etc. Similarly, use patterns may affect safe operating forces. A cart that was originally intended to carry a load of 250 kg (550 lb) may be put into service to handle a 500 kg (1100 lb) load, or the frequency of use may change from one every 10 minutes to once every 5 minutes, etc. Wear and tear on the cart or changes in the way in which it is used affect the forces needed to operate the cart, and it is important to be sure that the operating forces stay within safe limits. A good cart handling ergonomics program must periodically reassess carts to be certain that the operating forces are maintained within the recommended limits and that the use conditions are as originally specified. Not to do so means that an operator’s exposure to injury risk is unknown and uncontrolled. A key aspect of any cart maintenance program is the frequency with which carts need to be inspected. High cart loads, frequent trips or surface debris that could damage casters are examples of factors that can affect the length of time between inspection. Because casters play such an important role in determining push pull forces, they should be selected for durability and to match the usage conditions. Matching the use conditions to the appropriate caster can increase the time between regularly scheduled cart maintenance inspections. To mitigate MMH risk from the start and ongoing, it is crucial to initially design the cart and task so that all operating forces are within safe limits and perform routine verification and maintenance to ensure that the operating forces remain within those recommended limits throughout the economic life of the cart. Swivel Caster, Rig made of pressed steel, bright zinc finish, Top Plate mounting. Urethane wheel tread, Roller bearing. Swivel Caster with Brake Option, Rig made of pressed steel, bright zinc finish, Top Plate mounting. Urethane wheel tread, Roller bearing. Swivel Caster with Four-Position Lock Option, Rig made of pressed steel, bright zinc finish, Top Plate mounting. Urethane wheel tread, Roller bearing.